(p) Atlas of Remote Islands: Fifty Islands I have never set foot on and never will by Judith Schalansky – this is delightful book, each island effectively being a short story that I dip into occasionally. Beautifully bound and printed yet still about the cost of a paperback in Oz. 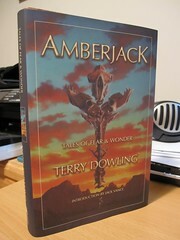 (p) Amberjack: Tales of Fear and Wonder by Terry Dowling – a collection of short stories I dip into from time to time. I’ve read several of his books and am fond of his writing. (e) Sanctus by Simon Toyne. I have a soft spot for conspiracy tales and I really enjoyed this one. Never managed to finish a book during filmfest but having this on the kindle made it a lot easier to read here and there, in the gaps of the day. I think now that I’ve finished off the Miles series and now Sanctus, I’d like to get back to Merchants of Doubt as it was very easy to get into and I’m keen to finish it. (e) Sanctus by Simon Boyne – spotted this in a bookshop for AU$26 and decided not to buy it. Got home and happened to check online and was able to get it for the kindle for US$7.